The next morning I woke up quite early a bit apprehensive about what the day had in store for me. I got ready and went down to the reception and was pleasantly surprised to learn that a hotel taxi had been arranged to drop me to the airport – all complimentary! It was not that I did not have any money, I was carrying travellers cheques but I had very little cash to spare, hence the relief! I thanked the hotel manager, the staff and was soon on my way to the airport. (My diary does not mention anything about having a breakfast despite having no dinner the previous night – shows how much importance I gave to food – then and now :)) At the airport counter I was asked to pay for excess luggage, I was about to argue when a nice gentleman right behind me in the queue agreed to put the bags under his name as he was travelling without any check-in luggage. I got even more lucky after that as I was not made to wait in the immigration queue and a kind officer helped me fill my forms, made me skip the queue and also assisted me all the way till my gate. The flight was quite good but my mind was constantly worrying about what would happen in Manila if there was nobody to pick me up. I soon got chatting with the air hostess who later on took me to the cockpit to meet the pilot! It was my first time ever in a plane’s cockpit area and I was amazed to see the range of switches and the complexity of gadgets there. I sat there for some time and was even offered a juice by the pilot! All my worries seemed to fade away as the plane landed smoothly at Manila airport where I was warmly welcomed by two Philippina ladies who assisted me out of customs and security checks straight into a fancy limousine! I was driven to the Philippine Plaza hotel and as we entered the hotel porch, I was welcomed by the security staff who assisted me to the reception area where I was asked to complete the formalities and was given my room key. I was just about relaxing in my room when in walked Ms. USA who happened to be my room mate and was twice my height! She asked me to quickly get ready for a photoshoot. I was so tired after my journey that I found it difficult to smile for the photographs and after all was done, literally raced to have my dinner in the confines of my bedroom, physically and mentally exhausted!! The days just flew by as more ‘beauty queens’ arrived from their respective countries tagging along their valises. It was amazing how many suitcases each one carried and here I thought I had a bit too much! It was the traditional costumes that occupied most of the space according to me. While mine was an elaborate gold and off-white sequined flowing ‘ghagra choli’ (flair long skirt with a tight fitted blouse) with a beaded ‘dupatta’ (long scarf) that was quite elaborate and bulky, the traditional costume worn by Miss Mexico took the cake! Her outfit was made of colourful feathers all fanning out from behind her dress and a beautiful headgear made of fancy ostrich plumes! It was a great experience meeting so many girls from so many different countries, different cultures, most of them could speak English but there were a few who couldn’t speak a word of it and needed a translator all the time. While we were treated like VIPs and escorted around everywhere, we were also made to slog hard. I remember once we were made to wake up at 4:00 am so that we were dressed and ready by 5:00 am for a photoshoot at the airport where all of us had to wear traditional Philippine costumes. It was an early morning sunrise shot and the director just couldn’t get the ‘right’ light making us do re-takes all the time. By the time we finished I was quite tired and it was only 9:00 am! We had quite a few such sponsored sessions, rehearsals, outings over the new few weeks. One of the outings that I really liked was a visit to an orphanage where we interacted with orphaned children, we read them stories, sang songs with them and distributed some provisions. Of course it was all being video-recorded and pre-planned, but one particular girl became quite special to me as she kept following me around saying “mummy-mummy.” I remember leaving behind my earrings for her that she was so thrilled to receive! Another time we were taken to an amusement park where we had so much fun sitting on the rides without having to wait in the queues, just like VIPs, and had press photographers following us all the time! I also got to experience my very first helicopter ride. A few of us got the chance to visit a small island outside Manila and we were flown there in a private helicopter. While I was very excited at first, after some time I could not bear the loud whirring noise and the wind blowing in and I wanted to land soon which we did on a remote island – right in the middle of a white, pristine beach with sand as soft as silk. This was not a part of any sponsored event so we got to be just ourselves and spent the whole day at the beach swimming, eating and basically just relaxing. 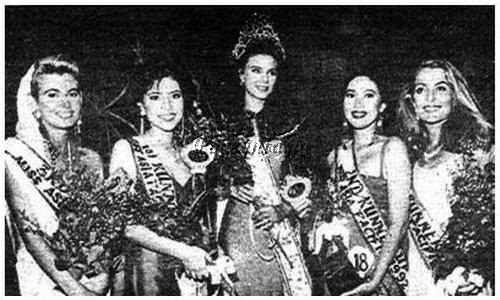 I made two good friends that day – Ms. Canada and Ms. Thailand and we stayed close for the rest of the pageant days. We were taken for lunches, dinners, cocktail parties and sponsored events. As the contest date came closer we were also taken for press meetings where we were supposed to dress in our National costumes and talk about our country. There were also some pre-judging events where we had to meet each judge on a one-on-one basis in all our different outfits. Rehearsals took place everyday after that and we would meet the judges causally at dinner events. Everything was rehearsed and practiced so much that the actual day of the contest just seemed like one big rehearsal! The judges looked bored, the audience looked blank, we danced and parroted our lines as rehearsed, the audience clapped as if on cue and the winners names were announced as if everyone knew who they were – 1st place: Ms. Israel, 2nd place: Ms. Thailand, 3rd place: Ms. Phillippines, 4th place: Ms. New Zealand and 5th place: Ms. Australia. I was too exhausted to even feel sad that I did not win. I was just happy that the contest was finally over and all I wanted to do was to go back home to my country and to my mother.